Thanks to Crete's rugged terrain, the big effects of commercial tourism keep evading Sfakia, a tiny settlement on the island's southwestern coastline. Although it increasingly caters to foreign travelers, the village remains an amiable and relaxed place a world away from Crete's more popular and often overcrowded seaside resorts. 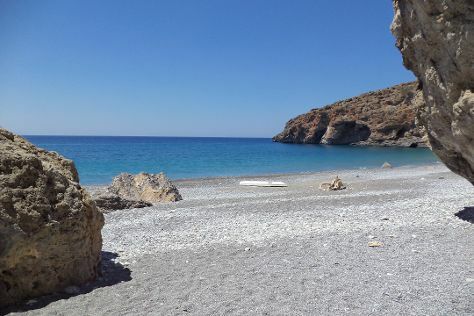 Instead of hurrying through Sfakia on your way somewhere else, take advantage of its tranquil atmosphere and isolated beaches, ideal for private swims and leisurely picnics. Sfakia also serves as a convenient starting point for sightseeing tours of the island's interior, famed for its many Minoan sites and remains of Roman aqueducts. Sfakia is in Chania Prefecture. With our international travel planner, Greece vacations can be built around trips to Sfakia and other destinations in Greece. Thanks to the rugged terrain of Crete's southwestern coastline, Sfakia remains a tiny settlement with just a few hotels, which offer clean rooms with sea views. Most people rush through Sfakia on their way to the island's more popular resorts, which means that you can choose from affordable rooms in town even at the height of tourist season. A good alternative to hotels, the area's family-run guesthouses provide simply furnished rooms, hearty local dishes, and easy access to nearby beaches.